I was strolling around a gallery in London when I first came across a portrait by Mary Beale, Britain’s first professional woman painter. I was struck by the clarity, texture and warmth of colours used, despite the fact that it was a seventeenth-century painting. I promised myself that I would look up the painter on Art UK to see what other portraits this artist had produced, and to find out more about her background and history. It turned out that in her day, feminists and women artists applauded Beale because she succeeded in the male world of portrait painting. She was born Mary Cradock, in Barrow, Suffolk, the eldest child of John Cradock, a Puritan rector, and married Charles Beale in 1652 at the age of 18. Her father was a notable amateur painter, and probably her first teacher. By 1660 she had gained recognition as an artist as well as giving birth to two sons, and her reputation started to take off. However, due to the insecurity of her husband’s job and the plague in London, the family moved to Allbrook, Otterbourne, Hampshire. The Allbrook Farmhouse still exists as a designated grade-II listed building, and was recently renovated and restored as a family home. Mary not only painted but she wrote as well, and whilst living in Hampshire she wrote Essay on Friendship, in which she expressed her radical thoughts, for that period, of equality between men and women, both in friendship and marriage. 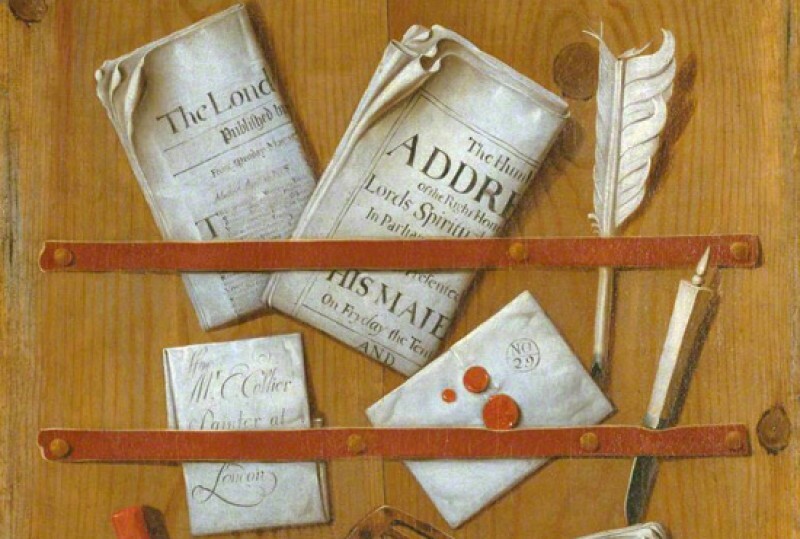 This philosophy was later put into practice, as in 1670 she established a studio in Pall Mall, with her husband working as her assistant, mixing her paints and keeping her accounts. Her work attracted a wide clientele with commissions from amongst the gentry and aristocracy, and from their own distinguished circle of friends. A portrait of Gilbert Burnet (c.1675) is an example with excellent use of light and shade. Beale introduced a range of styles in her work, particularly in her portraits of women, and used many informal poses e.g. the Portrait of a Young Girl in Profile (c.1680),with its delightful colour tones and the expressive face. Her immediate family is well represented and the portrait of Charles Beale (c.1680), oil on bed ticking, illustrates her use of alternatives to the artists’ canvas. Beale also painted numerous self portraits: the National Portrait Gallery’s c.1665 example is particularly striking. Her prices were competitive, and when her sons were old enough they assisted with the painting of draperies. Later she practised what she preached by training and employing female studio assistants. Her husband took responsibility for organising the commissions and payments, preparing artists’ colours and maintaining her notebooks. Mary Beale died in 1699 in Pall Mall, and was buried at St James’s Piccadilly, London.